Overcome the false dichotomy of science and myth by exploring the experiential depths of psychophysical reality. Is our Topology of Space inherent or imposed from our interconnective relationship to self, world, and cosmos? What is the nature of being seen from within? Mathematical solids are interesting facts but also carry a host of mythic associations valuable to the soul which carry deep meaning in the geometry of the imagination. A new entity is produced when duality is enclosed: dual aspects of light and dark, form and formlessness, conscious and unconscious, ideal and transient, male and female, spirit and nature, sacred and profane, order and disorder, the known and the unknown. Images mediate authentic holistic Presence into incarnated divinity. Image is alchemical -- the fruit of realized soul. Image work is transformative. Material changes have spiritual consequences, as spiritual changes have material consequences. Rituals are rites of discovery and transmutation of religious function as instinct. The therapeutic frame is analogous to the magical and cosmic frame. All recognize the ontological status of the demarcated unconscious dimension. Mathematical metaphors model the zeitgeist of their epoch. But more than a metaphor, the secret to life is in these forms and numbers, including the secret of the Flower of Life and the potential of the Ether or virtual vacuum which pervades all scales from micro- to macrocosm. 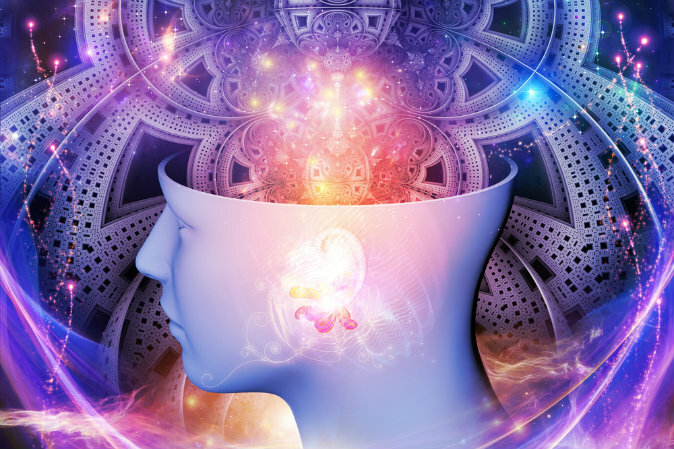 We can have epiphanies into the very nature of reality, profound understanding and amplified meanings, and the feeling of universal oneness with the hidden cosmic consciousness of all things. We can tune into and feel with a penetrating deep understanding that everything is interconnected and interdependent in an inseparable cosmic web of relationships. Soul is also attentiveness. We have to bring our own understanding to the Heavenly Stone of Light. When we are gone, only the ultimate question remains. Evidence that consciousness survives death remains elusive. With or without warm, welcoming smiles from relatives we may have loathed in life, it remains our obsession to know what happens when our screen-reality stops, and fades to black. Conscious immortality remains questionable. This writer remains firmly agnostic but enjoys entertaining wishful thinking. Death is the greatest mystery of life. Buddha rejected the question as useless, according to Jung. Throughout history, it remains a source of wonder, fear, hopefulness, and puzzlement. We seek compassionate ways of dealing with this uncertainty that no discussion of entanglement or holographic memory can assuage. There is little wonder we tend to fall back on traditional attitudes informed by simplicity, meaningful ceremony, and acceptance. It is something we cannot grasp at all, despite our conceptions of time and space and what might lie beyond them, even if some of our psychic experience seems unbound by spacetime. There is NoWhere to go and we are all going to get there. 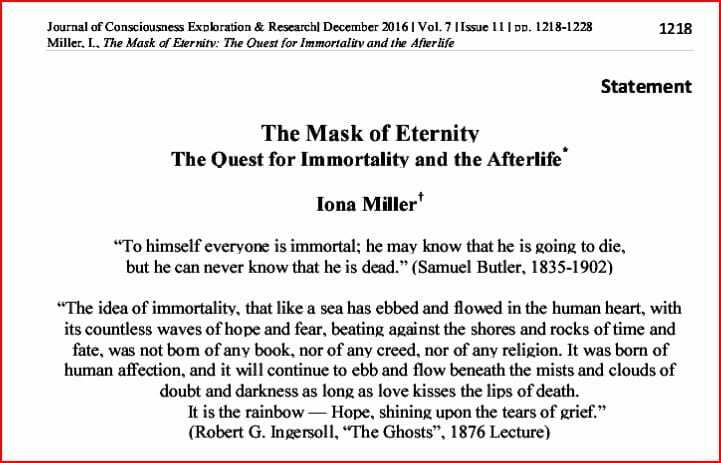 ABSTRACT: For many years, persons known and unknown to the first author (Miller) have reported her appearance in their dreams in a meaningful way, some more than others. 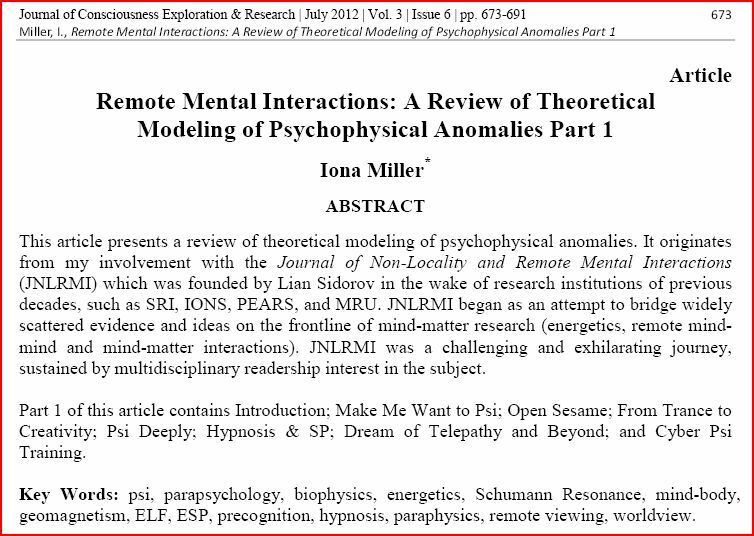 Some presume it is a psi anomaly involving two people -- a telepathic, mystical, psychic, even prophetic dream. 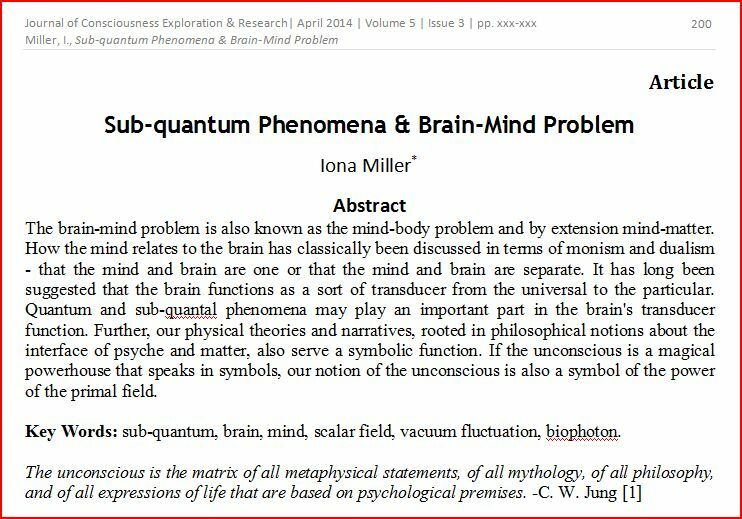 An experienced writer in psi experiences, genetic psi, and professional dreamwork, Miller has examined such examples, which continue to be reported to her, with a phenomenological approach. Whatever information the dream conveys as images and impressions are direct and intense. However, we must be carriers of the opposites, not exteriorizers, but more accurate elementary perceivers of the environment and instinctual soul. We learn to hold on to the tensions as physicality made more conscious as the code of the soul, instead of acting them out. Then that stratified meaning incarnates as embodiment and tangible actualization and carries you. It is not the dream figure that needs manifesting but consciousness or realization of the personification as symbolic material representation; emotional memory process not product. Personal experience brings highly spiritual material down-to-earth. Like ourselves, dream are partly empirical and partly transcendent. Objective psyche moves subjective feeling as the moving force in all life -- am embodied "poetic ecology," feeling the others manifest in their appearance and incarnate in the bodies of other organisms. Nature, anima mundi, in this fashion exemplifies what we also are -- our soul is the whole world. It is the living medium of our emotions and our mental concepts as we are the living manifestation of psyche. 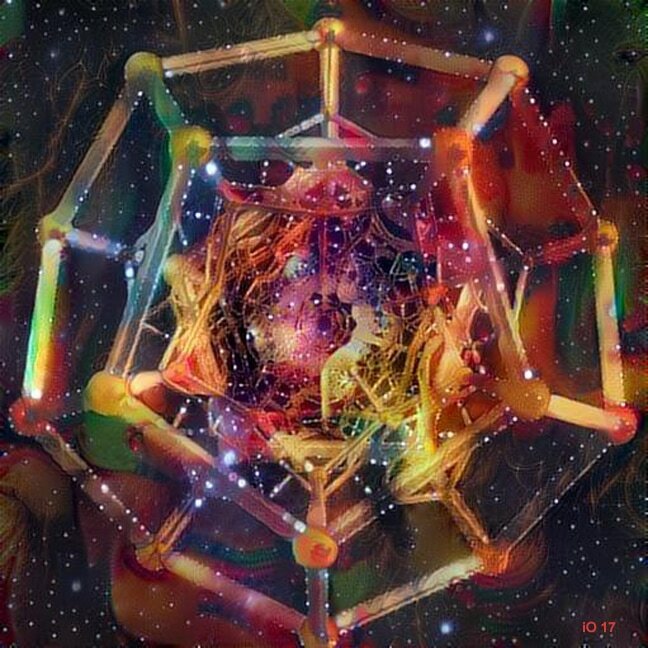 ARCHETYPAL DODECAHEDRON: "Master of All Shapes"; "Frame of Frames"; "Great Foundation Stone"; "Anatomy of the Body of God"; "Radiant Wisdom Stone"
The archetype of the Universe is a coherent framework of meaning underlying order that shapes our worldview and life experiences. The shape of the universe shapes us. Geometry is one of the earliest and most fundamental branches of Mathematics. The unformed takes on form. Imagination generates intuitions, ideas, emotions, and behaviors. Physics alone is an incomplete view of the universe. It has taken on issues once considered metaphysical. Mystics and physicists consider the dodecahedron the building block of the universe. The imaginal shape of the universe as a whole unites psyche and matter, Above and Below. Because an archetype of the universe is symbolic and metaphorical with many interpretations, it doesn't really matter if theories based on it are 'true' or not. The distinguishing feature is that it recurrently presents itself for imaginal consideration over the centuries. That is, it appears in the psyches of philosophers, mystics, and scientists of all eras proclaiming its own importance, including through its correspondence with Space or Ether, or the source field. Whether we worship it, philosophize, or theorize about it likewise makes little difference, as the inherent fascination for imagining the universe in this form remains. We are challenged to name another such figure with this historical vigor and scope of interest. After centuries of unpacking, the phenomenological and symbolic core remains. It is not a 'rogue' phenomenon. In the psyche, repetition or cyclic recurrence signals symbolic importance. This ultimate shape embodies the Phi Code. More than a symbol, the dodecahedron is a manifold of symbolism. 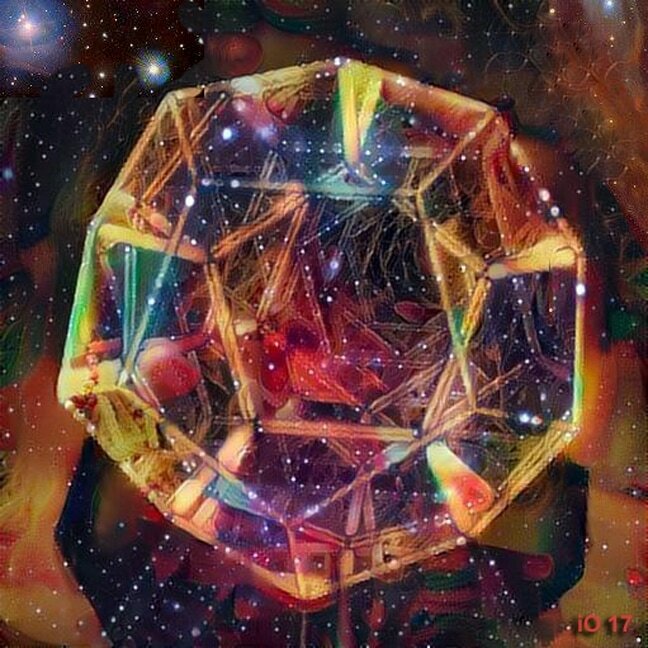 The archetypal dodecahedron arises from the creative autonomy of psyche. We can approach it philosophically through dreams, science, psychology, theosophy, theurgy, or magick depending on our interest and calling. Jung called symbols "spirit from above." If our experience consists solely of images, it consists solely of archetypes. Such a 'being' lives of itself and speaks to our soul, so we can approach it experientially as a fountain of wisdom as well as conceptually, inviting multiple interpretations and a real connection. The symbol spontaneously emerges before we start diluting or amplifying it with our thought. Wisdom Light presents itself as a Stone, the Grail, the Tree, and a myriad of forms. Therefore, we can approach it imaginally, esoterically, and psychologically, not just spiritually or literally for what it may reveal of cosmos, the construction of meanings, and our psychic lives. It rightly claims its status as the "Master of All Shapes," because the mathematics of its 12 pentagons (and 30 edges and 20 vertices) are aligned to the same proportions that design our DNA. We are in no way separate from that. 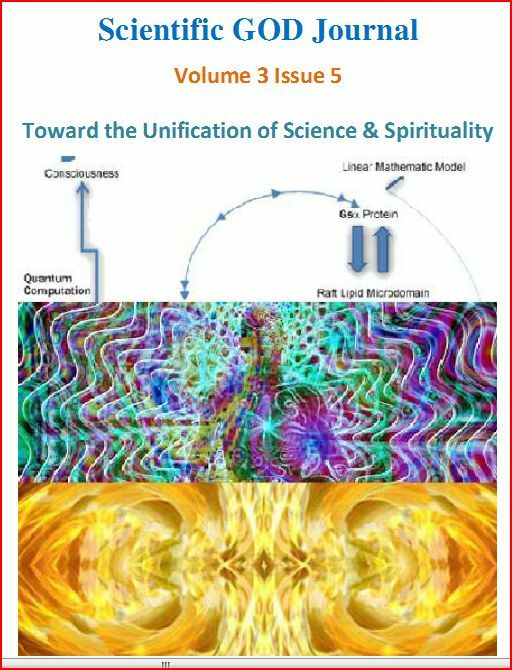 An emergent vision of science and spirituality re-ensouls the world after postmodern disenchantment and explores beyond the physicalist worldview, which is not only incomplete, but incorrect in its very foundation. An expanded science-based understanding of nature can accommodate empirical realities of spiritual sorts while also rejecting rationally untenable “overbeliefs” targeted by critics of institutional religions. This emerging vision is both scientifically justifiable and spiritually satisfying, combining the best aspects of our scientific and spiritual heritage in an intellectually responsible effort to reconcile these two greatest forces in human history. "Chamanisme, rapport aux ancêtres et intégration transgénérationnelle"
The Ancients already knew the therapeutic potential of the family links between generations that we rediscover in modern transgenerational analysis. Far from being a new fashion, the recognition of transgenerational processes dates back to the first shamanic type of communities. Their methods to cure "The Ancestor Syndrome" offer to contemporary therapies essential historical references and valuable teachings. Transgenerational integration brings a welcome middle ground for exchanges between traditional, shamanic and actual therapeutic approaches. This new field nourishes the rooting of contemporary practices as well as the renewal of ancestral wisdom. With the contribution of specialists from different backgrounds, this collective book presents a wide spectrum of perspectives to bridge traditional and modern knowledges. Olivier Douville is a psychoanalyst and anthropologist, international speaker and lecturer at University Paris 10 Nanterre and Paris 7 Denis-Diderot. C. Michael Smith Ph.D., is a Jungian psychologist and medical anthropologist, Cherokee-metis healer and teacher, director of Crows Nest International. Élisabeth Horowitz is a psychogenealogist therapist, int'l speaker and the author of numerous books. 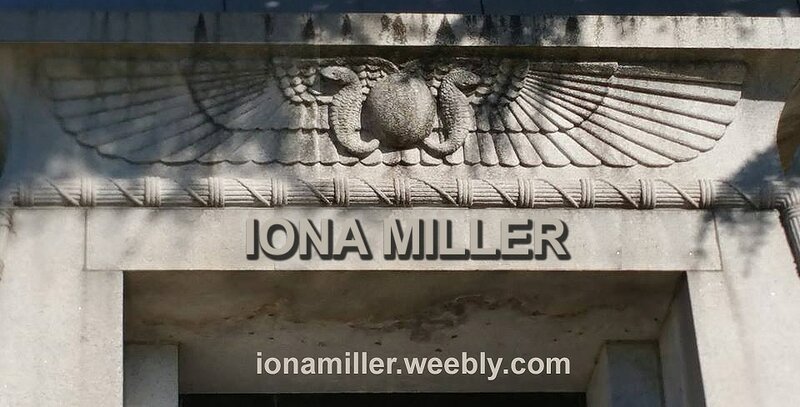 Iona Miller is a therapist, artist and consultant. Myron Eshowsky is an international mediator, author and shaman. 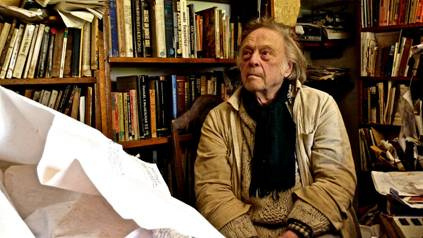 Pierre Ramaut is a transgenerational psychoanalyst. Thierry Gaillard is a depth psychologist, the author of a new thesis on the Œdipus myth. The fact that extra-sensory perception is real proves that time and space are psychically relative. That means that they can be more or less annihilated. 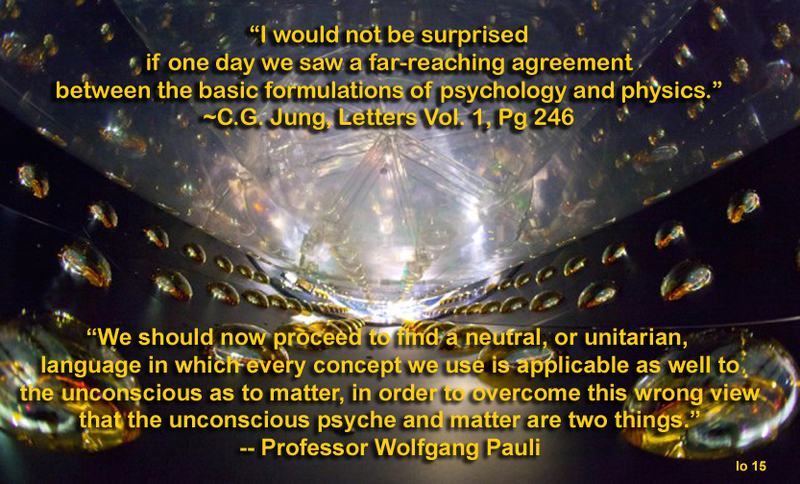 ~Carl Jung, Letters Volume 1, Pages 420-422.
by the function of the senses. ~Carl Jung, Letters Volume 1, Pages 420-422. But this much we do know beyond all doubt, that empirical reality has a transcendental background. neither, but rather a third thing, a neutral nature which can at most be grasped in hints since in essence it is transcendental. ~Carl Jung, CW 14, Pages 767-771. “The universe as a whole is in a pure state,” Lloyd said. Below: Iona Miller's work on Linguistic Color Perception and her 3-D DFA work, "KORE"
Why there is so much more matter than its oppositely-charged and oppositely-spinning twin, antimatter. This actually a question of why anything exists at all. One assumes the universe would treat matter and antimatter symmetrically, and thus that, at the moment of the Big Bang, equal amounts of matter and antimatter should have been produced. But if that had happened, there would have been a total annihilation of both: Protons would have canceled with antiprotons, electrons with anti-electrons (positrons), neutrons with antineutrons, and so on, leaving behind a dull sea of photons in a matterless expanse. For some reason, there was excess matter that didn't get annihilated, and here we are. For this, there is no accepted explanation. "The world is not locally real says John Bell. It's locally unreal says Murray Gell Mann. It's nonlocally real says Henry Stapp. It's both, says Niels Bohr under complementary situations. If we live in Susskind's hologram simulation, it's nonlocally unreal." As well as living, the work of our mortality involves paying fulfilling attention to death and dying. Armed with this, we can undertake the creation of a profound healing. Through and beyond the ego we access a profound and creative state of consciousness that provides our form and the core of our being. Here, we create our healing from within. We experience first-hand that personal power (empowerment) arises from within. Hallmarks of the shamanic experience include The Journey, Spirit Guides, Otherworld, Shamanic Calling, and Shamanic Awareness, including a cyclic worldview. The Medicine Wheel, the circle of life, is a shamanic healing model. The magic circle synergy of chaos and order is a mythic model for creation and a device for magical orientation and protection. It functions like a homing device, calling us backward to our foundation and forward to the future. As Hesse says in Steppenwolf, "We have no one to guide us. Our only guide is our homesickness." This motif illustrates four phases in the healing process as 1) Initiation, threshold experience; arousal 2) Letting Go, surrender to process; conception 3) New Vision, connecting with power; gestation, 4) Actualization, integration; rebirth. Newly-learned skills and intuition are put into fruitful practice, connecting one to self, community, and Universe, restoring balance. In his Process Meditation, Progoff (1982) offered some “Entrance Meditations” designed to open the experiential dimension. Such paradigms for self-inquiry facilitate therapeutic experience, meditative experience, and a transformative experience. “The White-Robed Monk” begins as we enter through a door in a tree. Then we 'descend' to find the wisdom figure. Such twilight states are a trance that intentionally encourages exploration of the depth dimension. Each us is the special door to our family tree. Progoff recommends journaling, too, and in some sense working the pedigree is like writing a transgenerational journal, especially if we use it in conjunction with a dialogue process. The personal narrative takes on a new dimension when it is extended to the family of the World Tree. Narrative is a powerful form. In our genealogical work the story unfolds of itself. The main requirement is simply participation. Participatory wisdom is an emergent function. Hillman reminds us, "To heal the symptom, we must heal the person, and to heal the person we must first heal the story in which the person has imagined himself." The universality of storytelling indicates it is not just social learning but reflects something deep-seated in our genes. Professor Daniel Siegel M.D. believes there is a neurological subplot of the well-made story involving the integration of the brain’s left and right hemispheres. Stories link the factual to the emotional, the specific to the universal, the past to the present. A psychological approach takes such imagery symbolically and metaphorically. A religious approach is usually more literal. We carry our histories, as well as the whole history of humanity, with us into the present through our bodies. Our feelings and thoughts become manifest in our physical structure. The past is "sedimented" in the body -- that is, it is embodied. Our bodies' sensory apparatus is the only way we experience the larger world. It is the medium through which we meet and respond to that world, feeling its reciprocal impact on us. Thus our symptoms can reflect our cultural as well as personal attitudes. Transhumanism (TH) is the movement to use technology (mainly in the areas of life sciences, alternative energies, and computer science) to challenge biological limitations and eventually find solutions to such limitations. It is often linked with the idea that science and technology can be used to continually improve the human condition. Examples of TH include artificial intelligence, cryogenics, space colonization, cloning, medical implants, cyborgs, cognitive enhancement, life extension, defect elimination (form of eugenics) and so on. With its current momentum, TH will directly impact your grandchildren before 2030. We need to intelligently explore and critically assess a wide range of issues directly and indirectly related to TH......and this edition of CRAFT aims to do precisely this. 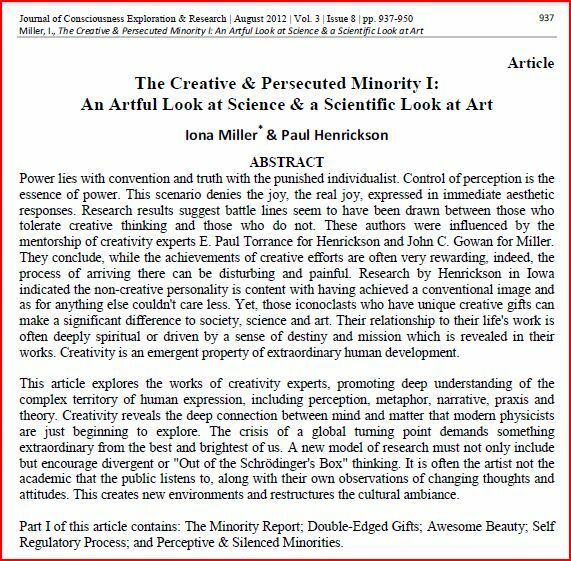 Article: The Creative & Persecuted Minority I: An Artful Look at Science & Scientific Look at Art. 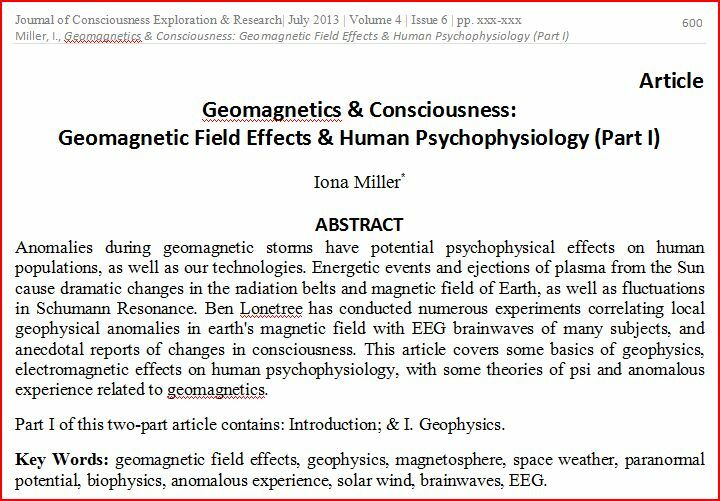 Article: A Retrospective Commentary on the Consciousness-Mapping of John C. Gowan I. 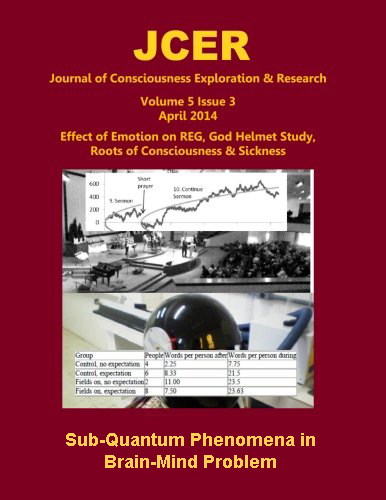 Article: A Retrospective Commentary on the Consciousness-Mapping of John C. Gowan II. Review Article: A Transdisciplinary Look at Paranthropology: An Emerging Field of Exploration. 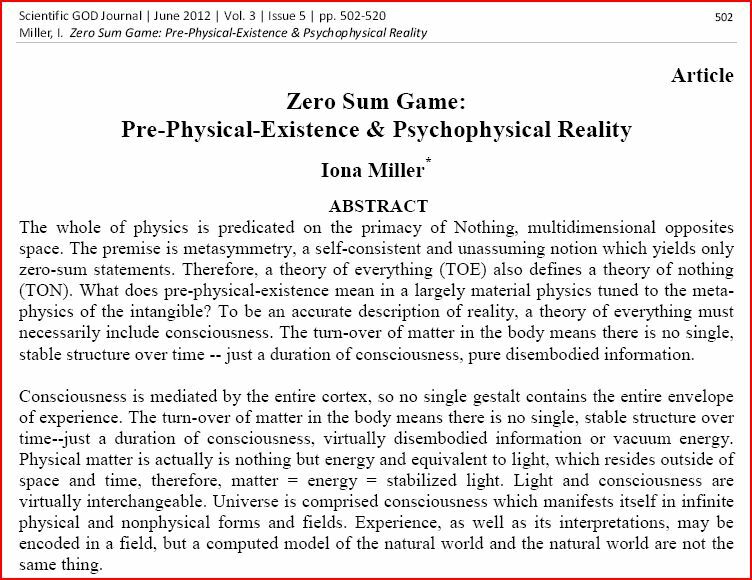 Iona Miller, The Nonlocal Mind Paradigm: A Transdisciplinary Revision of Mind-Body in Philosophy, Art & Science. 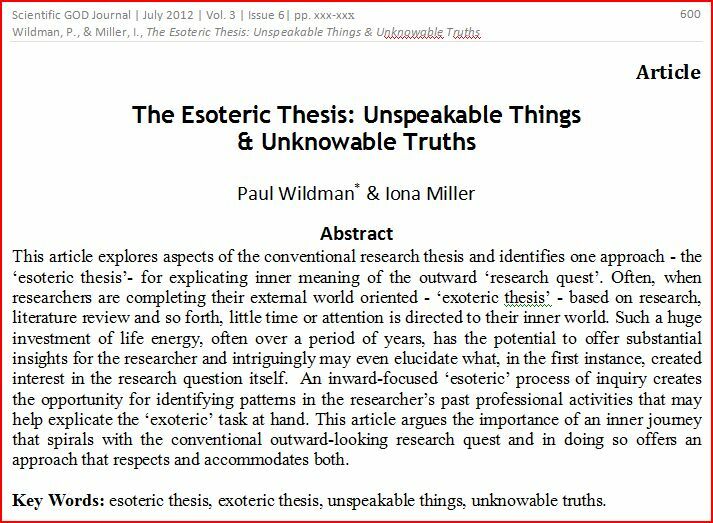 Article: Paul Wildman & Iona Miller, The Esoteric Thesis: Unspeakable Things & Unknowable Truths. 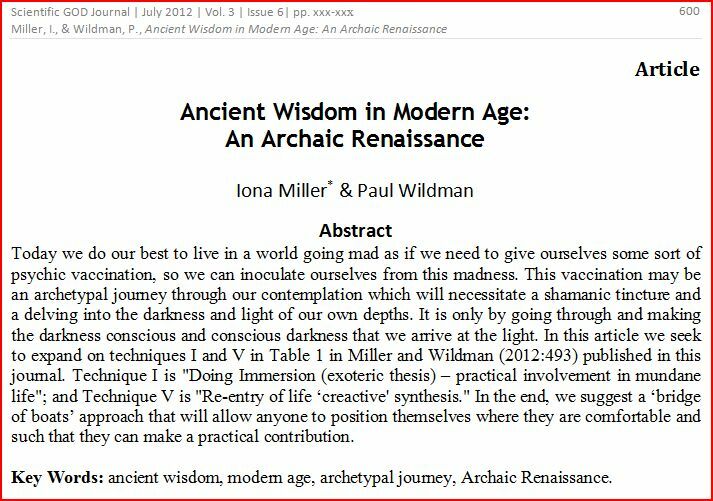 Article: Iona Miller & Paul Wildman, Ancient Wisdom in Modern Age: An Archaic Renaissance. 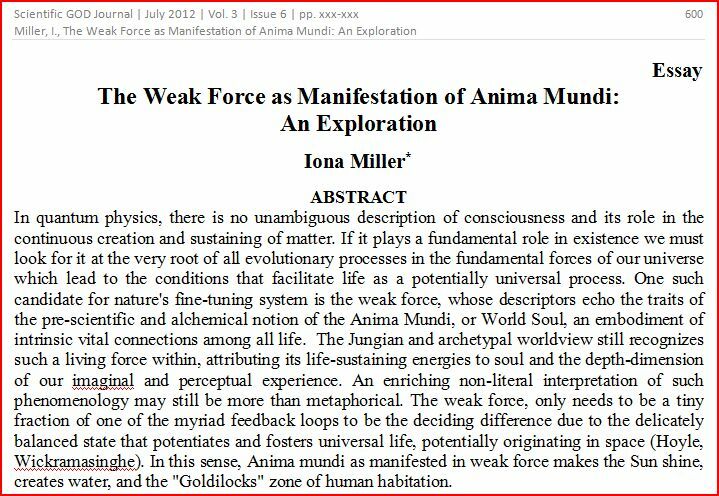 Essay: Iona Miller, The Weak Force as Manifestation of Anima Mundi: An Exploration. 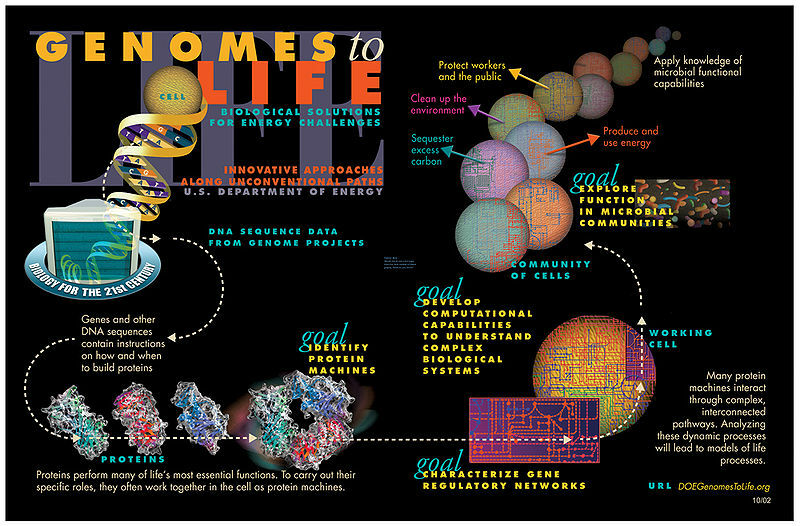 5) Biophysical Mechanisms of Genetic Regulation: Is There a Link to Mind-Body Healing? (6) A Proposal for Inferential Evidence of the DNA Phantom Effect. 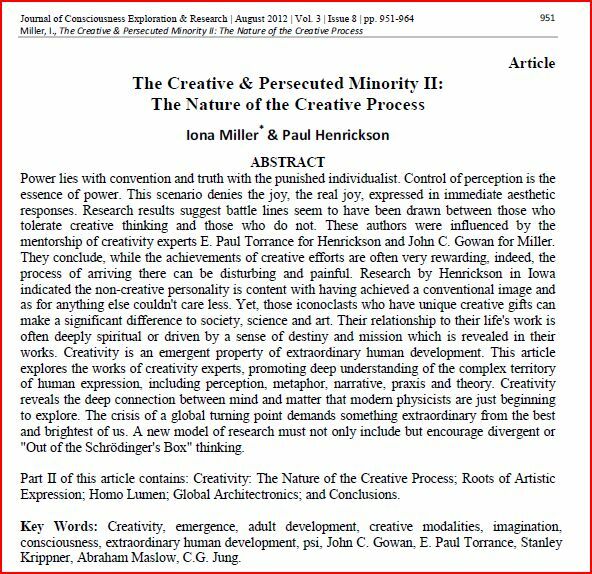 Article: The Creative & Persecuted Minority I: An Artful Look at Science & a Scientific Look at Art. Huping Hu There is possibly deeper and better theory and insight which form the foundation for the standard model (which does not account for gravity) and makes the standard model an approximation. 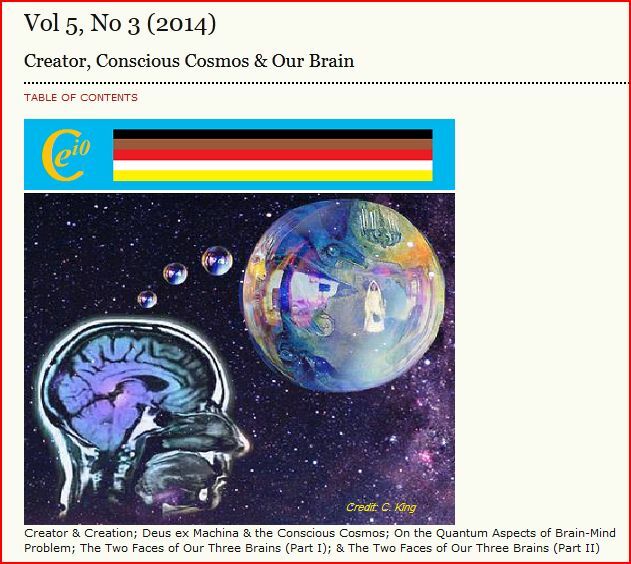 JCER, DNA Decipher Journal, & Scientific God Journal of QUANTUM DREAM, INC.
"DAATH: The God of the Gap"
Grave distortions and fraudulent claims to power characterize the spiritual path in our times. Discernment can be aided by a taxonomy of periodic risers in the stabilization of spiritual states of consciousness -- the milestones of transformation -- and learning the dynamics of self-delusion and misguided inner authority. Ready access to disinformation in beliefs and ideas created by others magnifies the problem. Emotionally appealing truths are sandwiched into idiosyncratic notions ranging from the speculative to the fantastical, and trap many individuals like flypaper, because our minds love a good story. The brain feeds on stories, but the wrong stories just lead us down the garden path into ancient worlds that never happened, and mythic scenarios that were never meant to be taken literally. Accepting the generalized commentary of so-called internet experts without critical thinking can derail the dynamic process of self transformation, by leading us down the garden path of false beliefs. Accepting such beliefs uncritically is precisely the opposite of what Jung recommended as individuation. Such false beliefs tend to cluster around an individual's personal issues, but are mistaken for and confounded with historical, philosophical and scientific 'reality'. Controlling the ‘self-deceptive’ syndrome in beliefs and choice: In a nutshell, ‘self deception’ feelings during an ongoing decision-making process, is a source of personal confusion. The human brain consciously acquires and maintains a belief ‘a’ tailored to the individual’s present and past existential circumstances while simultaneously being consciously aware of good evidence to the contrary in co-existing belief ‘b’. Belief ‘a’ responds to the exigent circumstances of sheer species survival imperatives shared with other subhuman species that subconsciously also act to stay alive, experience the neuro-hormone driven psychic state of emotional feelings while being assisted by the corresponding good feeling of being socially accepted to share a cooperative labor with others in the community. This we had coined as the adaptive biopsychosocial (bps) equilibrium strategy for species biological survival. In an evolving reality these beliefs are expected to be modified. How much? Belief ‘a’, which many, including Libet, et al, thought we had no conscious control of, has been shown by fMRI to be the result of a very conscious contrivance to survive, at all costs, and why not? Do we have choices? Yes we humans do. Belief ‘b’ evolves in the direction and intensity that a given subjects’ intellectual resources, experiences, interests, etc. permit. It is the meditative Sancho Panza of Don Quixote’s meditations that exists in all of us, constantly warning and confusing us about dangers that maybe are there or not! Belief ‘a’ adaptively responds to existential phenomenological contingencies along bps guidelines, a problem solver. Belief ‘b’ reflects on the same contingency for effective solutions today AND the ‘day after tomorrow’. Beyond the perceptual phenomenological input could there be additional, non-conventional sources of information input? Quare. We believe so. Self-deception may represent a challenge if not an outright obstacle to self-knowledge and moral development. It is not easy to feel a stranger to yourself, consciously blind to your own moral failings while struggling to survive. We live an embellished, fictional version of REAL experiences lived in blood and flesh. When we meditate we discover unexpected relations and can enjoy abstract beauty and reach transfinity while in search for…what? We embody our conceptualization, a whole new fancy way of looking at the cosmological multiverse, an entirely new vision of a dynamical evolving phenomenological ‘reality,' and our relationship to it. Suddenly reality is you and your brain capacity to explain it. We submit ‘a’ and ‘b’ are both dynamically embedded into each other as a unit whole either one prevailing in control depending of the quality and nature of our inherited and acquired lifetime experiences. We can do dialogical "shuttle" therapy, speaking using the 2-chair technique to reveal how different parts of ourselves feel to one another. "Within the Mouth of the Deep"
The Unconscious is not separate from the body and the body is not separate from the Cosmos. When we turn our attention within we encounter the yawning Mouth of the Deep which contains the secrets of life and being. 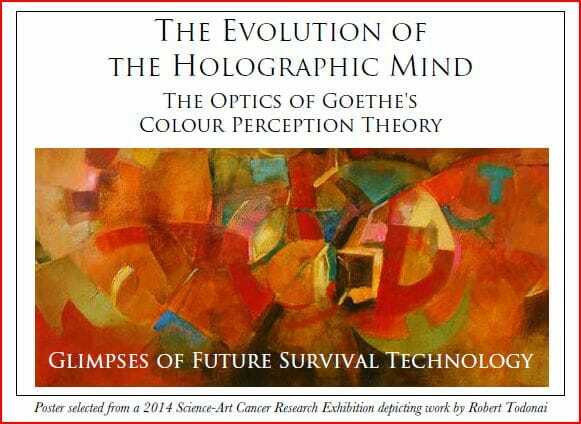 The unconscious is not separate from the body and timeless holographic history encoded in its wave genetics. The body is our deep memory, including our ancestral heritage. 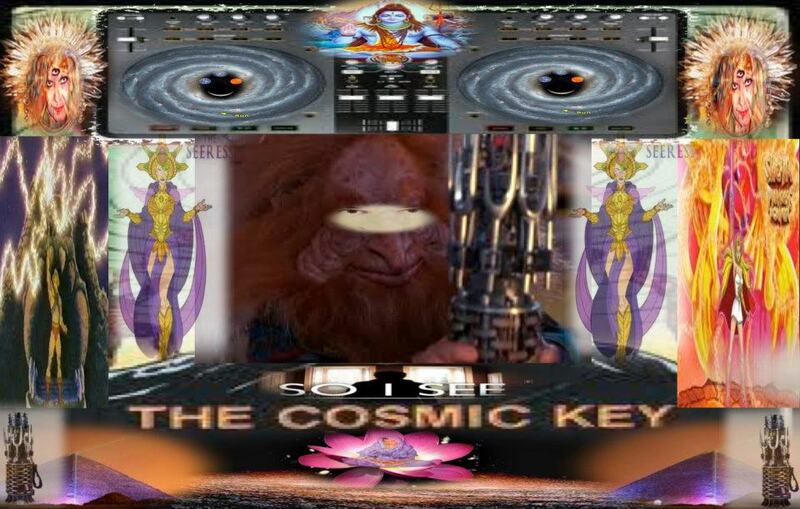 Highly charged psychophysical images encode somatic symptoms or dissociative disorders. We can guide ourselves to free negative residues of trauma frozen in the body and unconscious mind. Processing dissociative reactions gently facilitates psychophysical energy release, leading to reintegration of dissociated and fragmented parts of the psyche. Therapy works best when it emerges from one's inner healer, through one's own imagery, rather than via guided imagery or imported metaphors suggested from outside. Epistemological metaphors -- how you know what you know and what it's like -- are a gateway to the subconscious, as are dreams and symptoms. Content-free therapy can be done through metaphor, rather than through directly reliving trauma thereby avoiding re-traumatizing. In chaos theory, old forms must break down to make way for new ones to emerge. Healing occurs at the creative edge where new order emerges holistically. A small change in attitudes, the messages we send to ourselves, can make huge differences. Change the image and you change the associated attitudes and feelings. 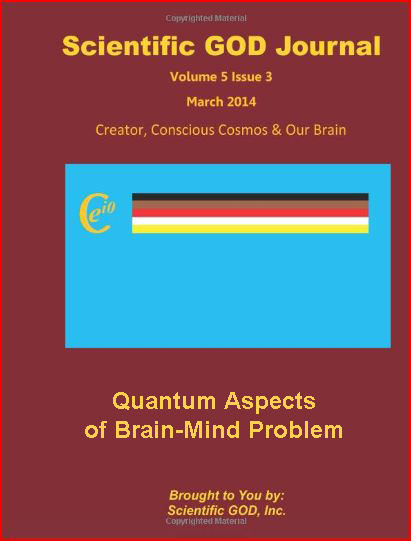 Article: Elio Conte, Nunzia Santacroce & Antonio Federici, Preliminary Considerations on a Possible Quantum Model of Consciousness Interfaced with a Non-Lipschitz Chaotic Dynamics of Neural Activity. 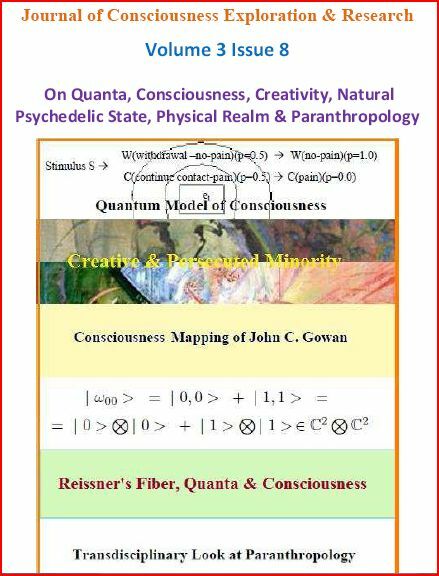 Article: Lawrence C. Wile, Reissner's Fiber, Quanta & Consciousness. The Unconscious is not separate from the body and the body is not separate from the Cosmos. When we turn our attention within we encounter the yawning Mouth of the Deep which contains the secrets of life and being. 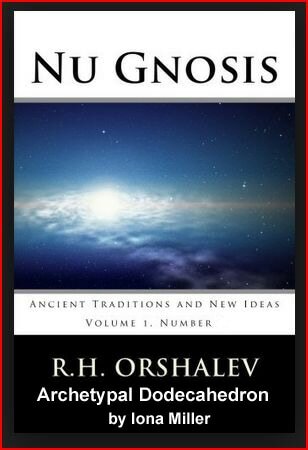 The unconscious is not separate from the body and timeless holographic history encoded in its wave genetics. The body is our memory. 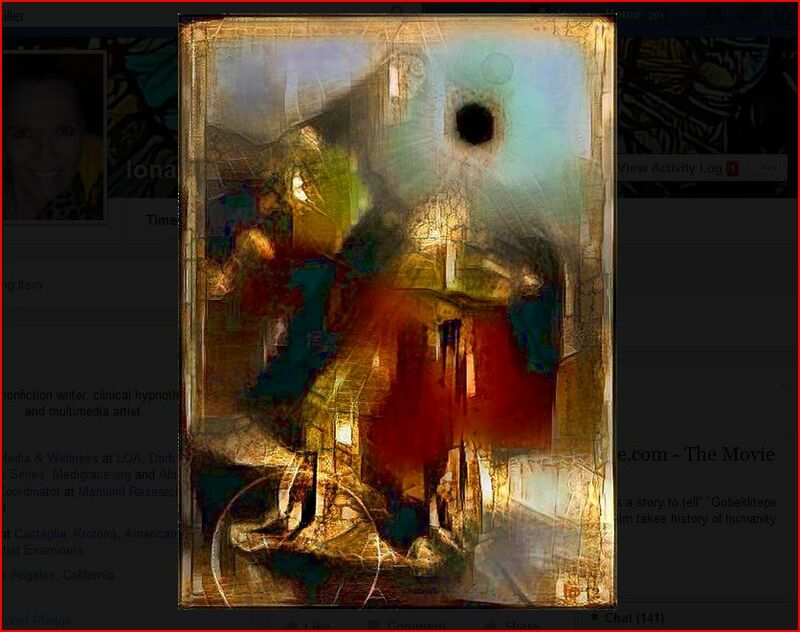 Remediation of Misconceptions & Self-Delusions in the Search for Self"
ABSTRACT: The 21st century nature of a scientific "G-O-D" as an acronym describes the little understood elements of Gravity, 0-Point energy, and Dark Energy (DE) and Dark Matter (DM). Like electricity, we know more about exploiting them than we do about their essential nature. Even that is an over-statement -- we dream of manipulating gravity, harnessing zero point energy, and exploiting negative matter, which besides negative mass and negative energy might have a negative gravitational charge and repel normal matter. Such puzzling conceptual issues of QM can hardly be solved here, but perhaps it is time to approach them in a slightly different way. In physics, 2012 is the year of the so-called God-particle, the Higgs boson, which underpins existence as the field that creates matter through resistance -- a sort of demiurgic potential. We still don't know just how "GOD" waves the magic quantum wand of creation that results in the power of being. Rather than projections of exalted deity, what kinds of symbols or metaphors can open our minds to the truth of such a scientific GOD? We have some confidence about gravity and the Zero Point groundstate, but the jury remains out on Dark Matter and Dark Energy. DM and DE may not exist; likewise, negative matter and negative energy. 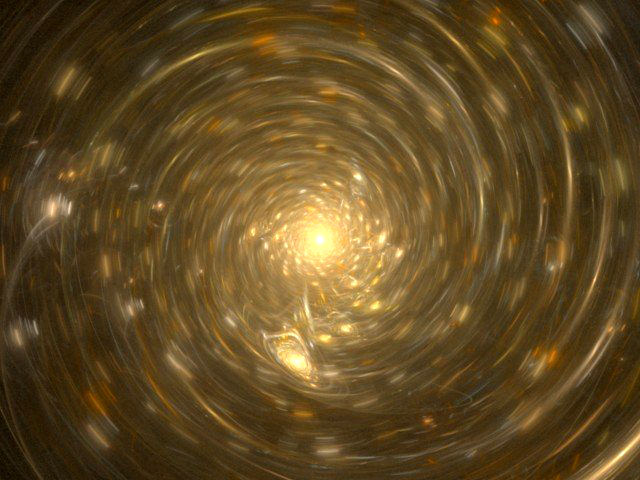 Negative matter could be dark matter. Antimatter does exist. Antimatter has positive mass. Whereas negative matter is a parallel set of particles with NEGATIVE MASS, essentially a "mirror" universe. We need to reexamine the nature of the groundstate in the light of new theories and postulates of Virtual Physics rather than irrelevant mathematical vagaries and flawed conventional theories. Mathematics should follow, not precede observation and inference. The ramifications of plausible alternative theories must be worked through to separate the lead of the unviable from the gold of new insights on the nature of reality. For the sake of this article, we call such an approach Virtual Physics. Others might call it "Dissident Physics." The Standard Model does not explain the gravitational force or the most vexing problem in physics--unifying the laws of gravity with those of quantum mechanics. Wildman, P. and Miller, I. (2012). This article seeks to identify the deep patterns we have found in our work individually and jointly over the past decade. We call these ‘the fingerprints of God’. To do this, in mid-2012, we applied Reflexive Praxis individually and then jointly to our work over the past three decades that is in total 60 years of praxis. Reflexive praxis is a method of social research that has been developed progressively in this Scientific God Journal through our series of five articles. In this article we seek to identify the underlying our ‘ur-pattern’ as common patterns in our day to day behaviour and apparently unrelated practices. We call them our cosmic principles or Gods fingerprints as they represent, we submit, ways in which the Universe/Cosmos/God seeks to create neg-entropy especially from a social perspective. Further we see them as an essential underlying pattern on which specific activities, callings and so forth are based – they can be seen as ‘ur-patterns’ after the German ‘ur’ for primal and archetypal, primeval even prime’itive and sauvage. Bloom (2012:227). This then has been our Reflexive Praxis quest for these hidden patterns. A quest that can be argued, in a purely random Universe comprised of incoherence and non-resonance, would be futile as there can be no patterns. So in some regards our quest will be ‘our folly house’. In this article we submit that these patterns emerge from what we call ‘muscular or hand knowledge’ i.e. our praxis. Others such as Bloom (2012:373, 378, 408, 554) refer to such prime’itive experiential knowledge as ‘visceral comprehension’ however such a hands on, gut level; approach to knowledge is vilified by our present systems of learning. Yet such knowledge was invaluable to Einstein for instance who imagined what it was like ‘running after a ray of light’ and catching up with it. Glocalisation proposes both theory and practice for bridging global/local scales in an alternative equitable international system, using a mosaic of committed key actors. The meaning of globally accessible information and economy becomes organised in its local context. Intense local and extensive global interaction is a dynamic that operates in fractally embedded spatial and cultural dimensions to mobilise and interface social and economic interaction at the local, national and transnational levels i.e. glocal, proactively responding to our responsibility to future generations. A potential movement, a peace-building activity combining realism and idealism, glocalisation is proposed as a bottom-up view of the complex process of harmonising local and global needs for sustainable futures. It brings globalisation issues down to the human scale, linking committed local and global social actors in a way that shows the global implications of local innovations. The immediate goal of glocalisation's scale-relativity is practical development of pilot projects and best practice scalable and replicable exemplars and policies, not recipes, which can be applied in many if not all areas. Our article includes proposals and concrete initiatives that promote balance of local and global dimensions via information sharing, economics and governance on a global or trans-regional basis. 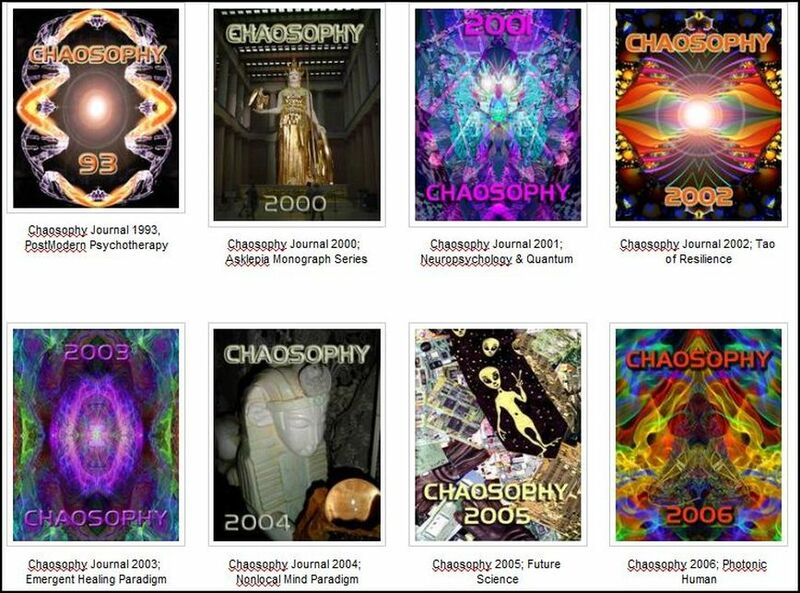 Keywords: Futuring, Chaos theory, negentropy, fractal-logic, creativity, values and ethics, sustainable lifestyles, learning, holism, communication, science-art, networking, depth psychology, transpersonal psychology, paradigm shift, complexity, imagination, consciousness studies, fractal logic. 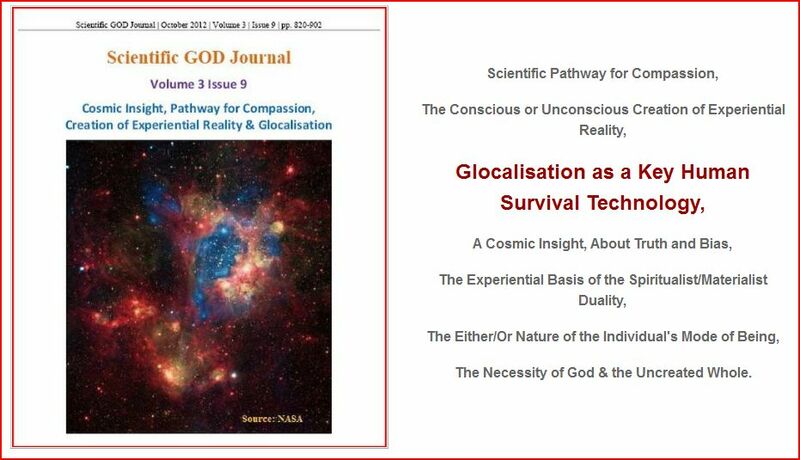 Publication Date: September 2, 2012 The purpose and mission of Scientific GOD Journal (http://www.scigod.com) are to conduct scientific inquiries on the nature and origins of life, mind, physical laws and mathematics and their possible connections to a scientifically approachable transcendental ground of existence – we call "Scientific GOD." We believe that in this Golden Age of Science the GOD in whom we trust should be spiritual as well as scientific. Indeed, since we are all made out of the same subatomic, atomic and genetic alphabets, the scientific GOD each of us seeks should be one and the same whatever our race, religion and other differences. 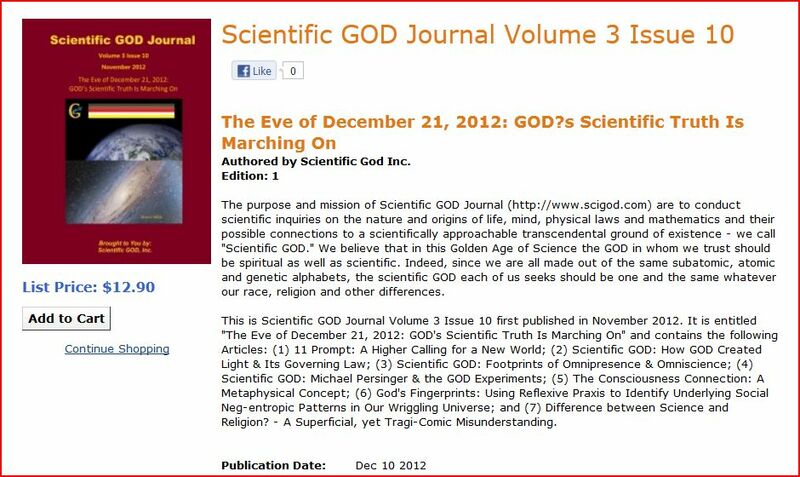 This is Scientific GOD Journal Volume 3 Issue 8 first published in August 2012. 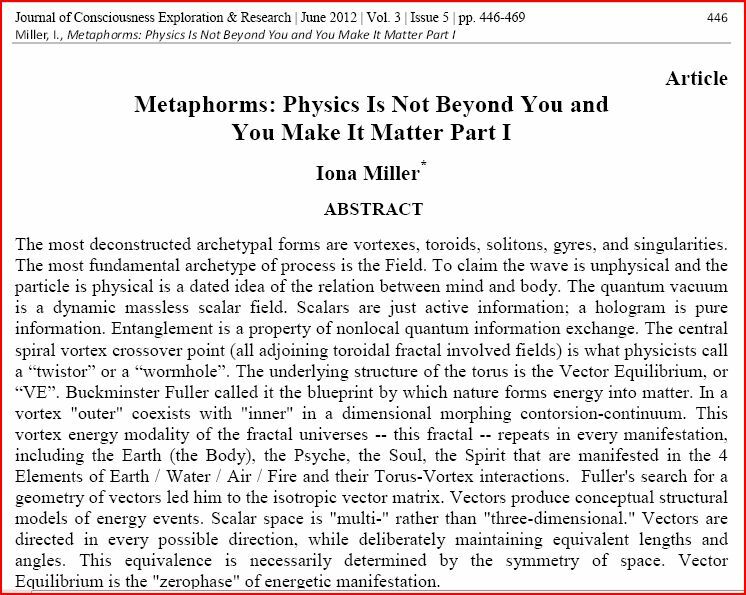 It is entitled "On Matter, Spacetime, Materialist Metaphysical Dogmatism & Reflexive Praxis" and contains the following Articles: (1) More Thoughts on Light, Matter, Space & Time; (2) Reflections on Materialist Metaphysical Dogmatism (Part I); (3) Reflections on Materialist Metaphysical Dogmatism (Part II); (4) Reflections on Materialist Metaphysical Dogmatism (Part III); (5) Research by Looking Backwards: Reflexive Praxis in Search of Archaic Wisdom; and (6) On Atheists’ Complaint of No Evidence for God. ABSTRACT: Many of us, as researchers, would find it challenging to let our research data speak to us rather that to see it exclusively as part of the methodological categories we have already developed. This article proposes a methodology called 'Reflexive Praxis', a form of action research, to do just this. As 'Action Research', such methodologies remain controversial compared with the more conventional Empirical Research'. Indeed any development of action research, such as reflexive praxis, may be expected to be treated with even more skepticism. Nonetheless this article seeks to explore reflexive praxis as one way with which the researcher can interrogate both her/his inner and outer worlds. It is hoped that by doing this as action researchers we may be able to apprehend new combinations and patterns in our research data and indeed our lived life. This in turn can help us as researchers encounter meta-meaning in these combinations. 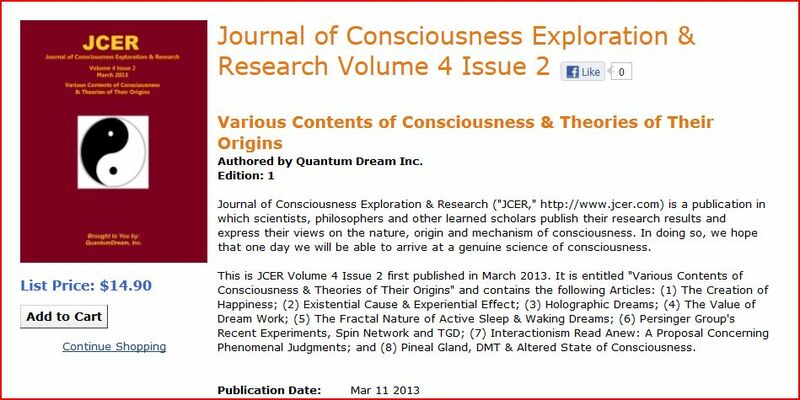 Publication Date: September 1, 2012 Journal of Consciousness Exploration & Research ("JCER," http://www.jcer.com) is a publication in which scientists, philosophers and other learned scholars publish their research results and express their views on the nature, origin and mechanism of consciousness. In doing so, we hope that one day we will be able to arrive at a genuine science of consciousness. This is JCER Volume 3 Issue 8 first published in August 2012. 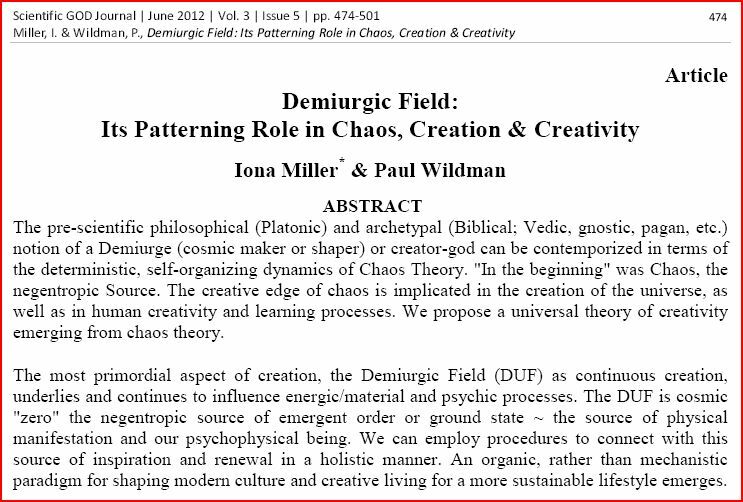 It is entitled "On Quanta, Consciousness, Creativity, Natural Psychedelic State, Physical Realm & Paranthropology" and contains the following Articles: (1) A Possible Quantum Model of Consciousness Interfaced with a Non-Lipschitz Chaotic Dynamics of Neural Activity (Part I); (2) A Possible Quantum Model of Consciousness Interfaced with a Non-Lipschitz Chaotic Dynamics of Neural Activity (Part II); (3) The Creative & Persecuted Minority I: An Artful Look at Science & a Scientific Look at Art; (4) The Creative & Persecuted Minority II: The Nature of the Creative Process; (5) A Retrospective Commentary on the Consciousness Mapping of John C. Gowan Part I; (6) A Retrospective Commentary on the Consciousness Mapping of John C. Gowan Part II; (7) Extension of the Physical Realm; (8) Reissner's Fiber, Quanta & Consciousness; and (9) A Transdisciplinary Look at Paranthropology: An Emerging Field of Exploration. 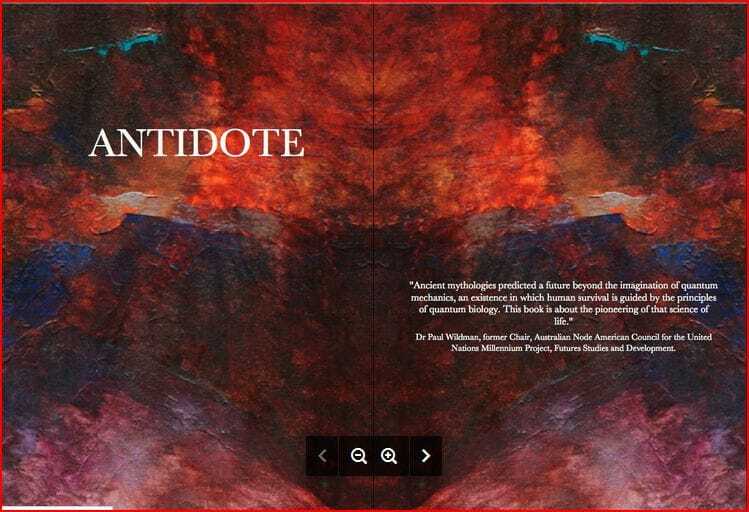 Residing in Malta, Paul Henrickson, PhD is an artist, published art critic, and contributing author to journals in the fields of education, art education, art and archaeology, anthropology, psychology. He has written an opera libretto in collaboration with a Maltese composer and been the local manager for performing artists. Dr. Henrickson was born in Massachusetts, (USA). He attended The Rhode Island School of Design, The University of Massachusetts (Boston), Clark University (Worcester), Statens Kunstakademiet (Oslo, Norway), The University of Oslo, and got his doctorate at The University of Minnesota. Henrickson offered art criticism seminars in New Mexico, has administered Art Departments and Divisions of Fine Arts at Vallet City State College, (North Dakota), Radford University, (Virginia), The University of Guam, (M.I.) and was on research assignments at The University of Minnesota and the University of Northern Iowa where he originated "The Creativity Packet", a puzzle-format creativity-enhancement tool. In the words of its editors, "Paranthropology: Journal of Anthropological Approaches to the Paranormal” is a free on-line journal devoted to the promotion of social-scientific approaches to the study of paranormal experiences, beliefs and phenomena in all of their varied guises. 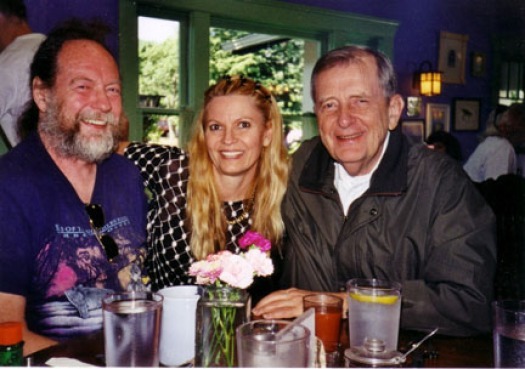 The journal aims to promote an interdisciplinary dialogue on issues of the paranormal, so as to move beyond the skeptic vs. advocate impasse which has settled over the current debate, and to open new avenues for inquiry and understanding." The 2012 anthology, Paranthropology: Anthropological Approaches to the Paranormal celebrates such pioneering exploration and attempts to lay down some basic principles for research, theory and practice, fusing humanities and science. The journal PARANTHROPOLOGY has broken through the wall of silence and dared to subjectively and objectively examine experiences formerly considered "supernatural" -- unexplainable personal and cultural phenomena. ABSTRACT: We can hark back for more than nostalgia to the classic chronicles of the psychedelic revolution. In 1974, creativity expert John Curtis Gowan, (Professor Emeritus, California State University, Northridge, California) published, DEVELOPMENT OF THE PSYCHEDELIC INDIVIDUAL: A Psychological Analysis of the Psychedelic State and Its attendant Psychic Powers. Gowan extracts the philosophical gold from such X-Events or "extreme events". 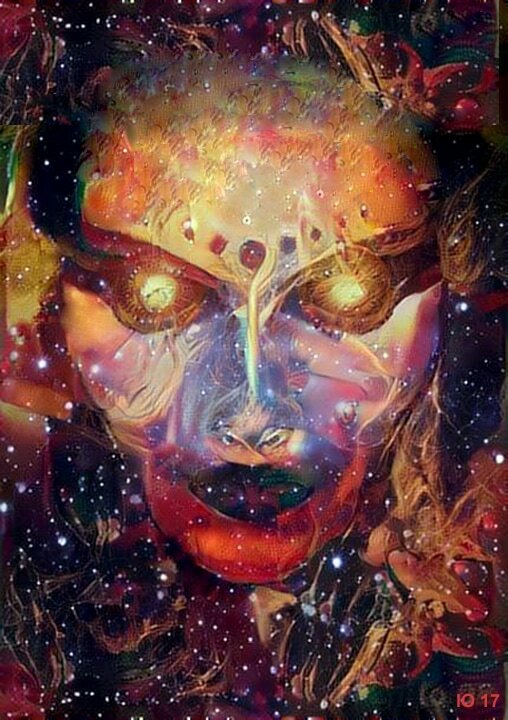 This article is not about drug-induced psychedelia, but about the natural psychedelic state of consciousness, as accessed through the process of self-actualization. Gowan's orientation is summarized, including his concepts of escalation and developmental dysplasia, and the creation of the Northridge Developmental Scale, a test for self-actualization. The commentary includes: 1). 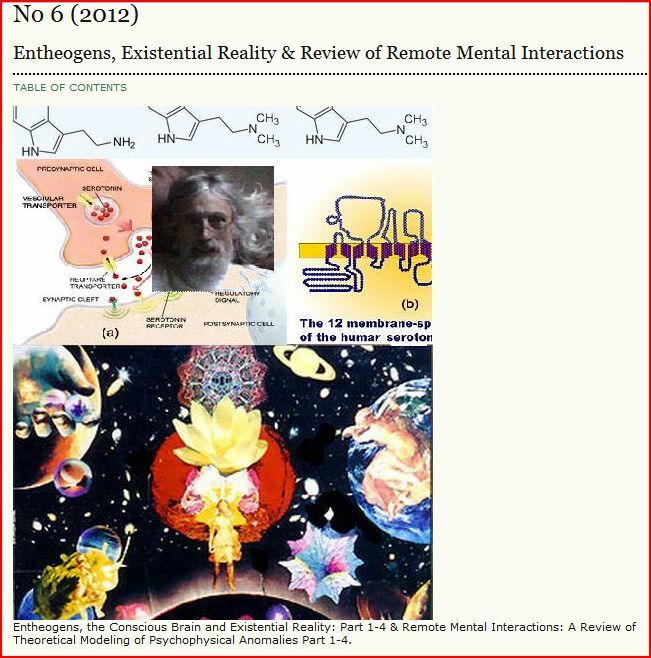 contemporary observations on the psychedelic stage in drugless experiential therapy, ("drug-free shamanism") for a current approach to Gowan's work, and 2). the qabalistic Tree of Life as an ancient map of consciousness and model of developmental escalation, interpreted in Gowan's terms with historical perspective. Jung popularized Alchemy as another model of transmutation and transformation. Chakras are a yogic model of development not covered here. 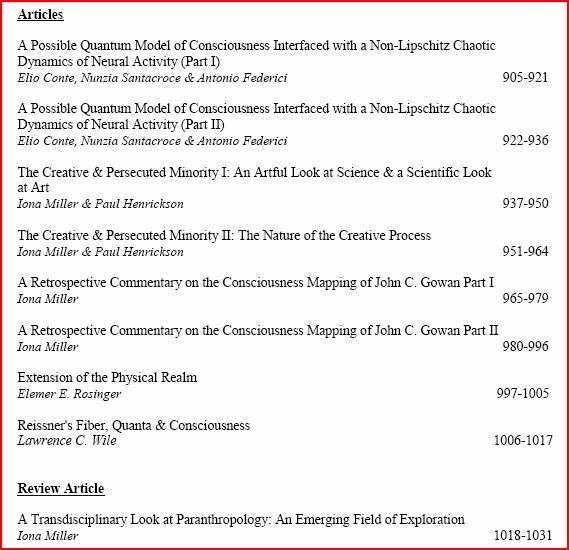 Gowan's work and taxonomies remain useful to the transdisciplinary community, including the fields of parapsychology, paranthropology, consciousness studies, psychotherapeutics, neurobiology, psychology of religion, child development, and more. In developing creative talent, imagery is more fluid and malleable to processing than language. He collates research from several then-new fields and provides valuable bibliographies of foundational works. While not widely known and applied, Gowan's work remains a vital resource, deserving curation within the literature of all sciences researching psi, nonordinary, and exceptional experiences (anomalous, transpersonal; neither or both). 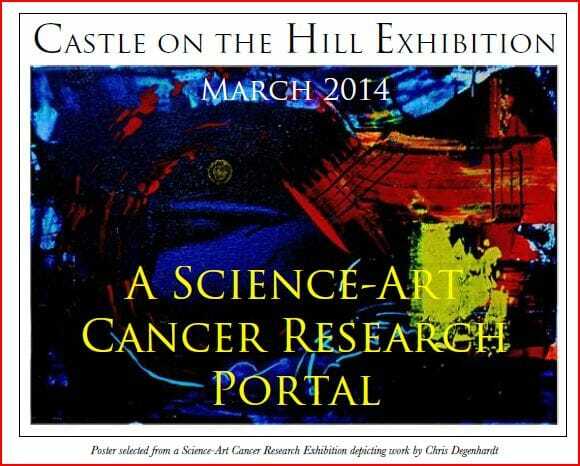 Gowan's work is invaluable for navigating the universe of meanings. Symbols are the currency of consciousness. They open the way for "ultraculture", wherein we become conscious co-creators of reality. 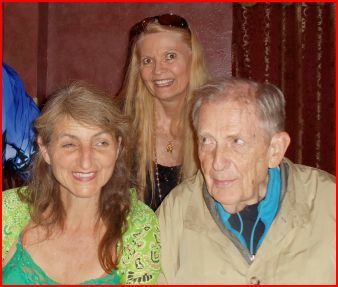 Higgs Report: Philip E. Gibbs, Live Higgs Report on July 4, 2012 & Congratulations - It's an Boson. Higgs Essay: Philip E. Gibbs, The Higgs Boson and the Power of Consistency. Higgs Essay: Dainis Zeps, Vita Principalis: Road to Single Mathematical Particle. 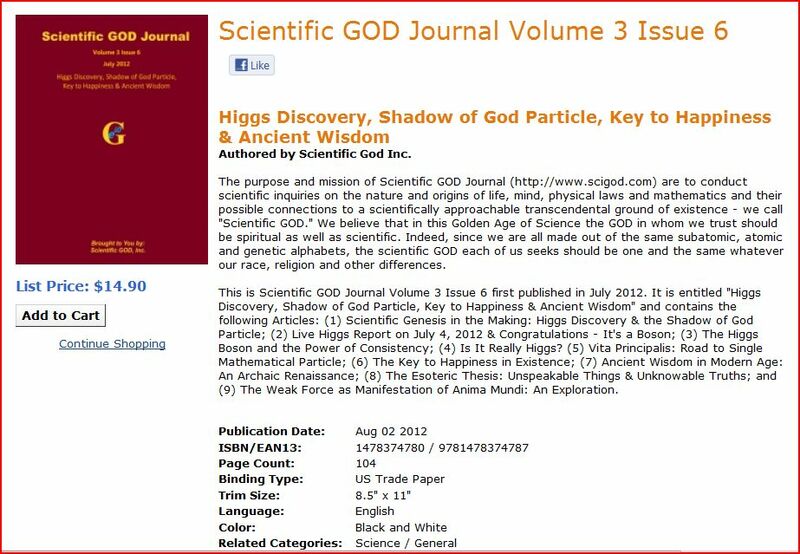 Editorial: Huping Hu & Maoxin Wu, [Scientific Genesis in the Making: Higgs Discovery as the Shadow of God Particle]. Dr. Paul Wildman, Brisbane, Australia, Chair of the Australasian Node of the Millennium Project. Over the past 15 years, Paul developed an extensive track record in the areas of, Strategic Planning, Futures Studies, Business and Organisational Development, Work Futures, Artificer Learning, and Edge Science. Presently he works in Kids and Adult Learning, through his family company KALGROVE Pty Ltd, which specialises in Child Care, and Adult Learning Development areas in the private sector, undertaking strategic, and catchment analyses in KALGROVE's business niche. He also runs a niche publishing business Prosperity Press publishing in futures related areas. From 1989-2001 he managed the Vocational Training area concentrating in Apprenticeships and Traineeships in Queensland. While from 1994-97 as lecturer at Southern Cross University (SCU) where he developed, and lectured in, Futures Studies (FS) then the only on line Masters specialisation in Futures Studies in the world. From 1997-2001 he was, and again from 2004, is node co-chair of the United Nation’s University’s Millennium Project for the Australasia. 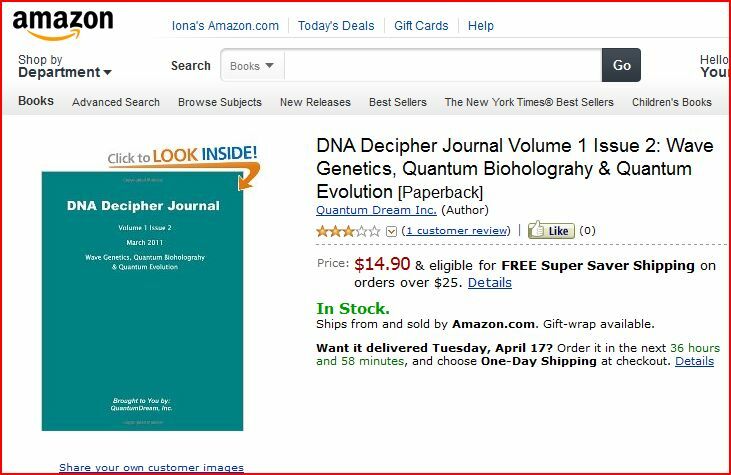 DNA Decipher Journal ("DNADJ," http://www.dnadecipher.com) is a publication in which biologists, physicists, mathematicians and other learned scholars publish their research results and express their views on the origin, nature and mechanism of DNA as a biological program and entity and its possible connection to a deeper reality. This is DNADJ Volume 2 Issue 2 first published in May 2012. 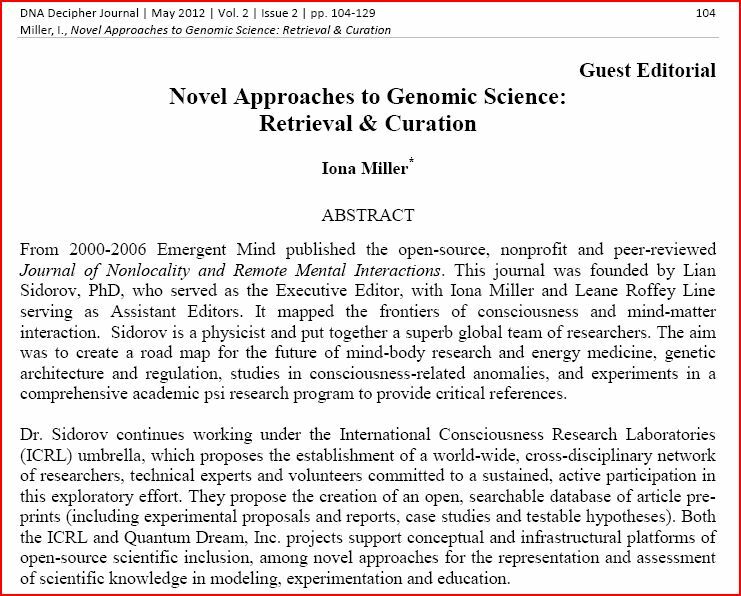 It is entitled "Novel Approaches to Genomic Science" and guest-edited by Iona Miller. 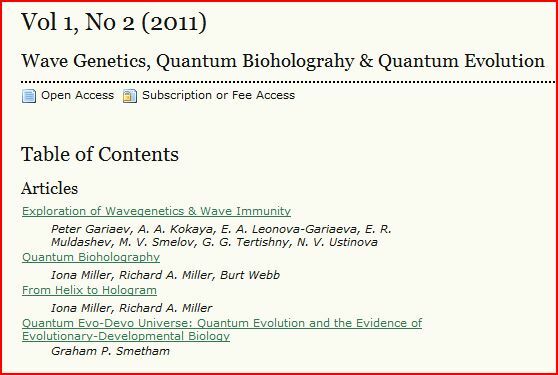 It contains the following articles: (1) Novel Approaches to Genomic Science: Retrieval & Curation; (2) Embryonic Holography: An Application of the Holographic Concept of Reality; (3) The Bioelectronic Basis for “Healing Energies”: Charge and Field Effects as a Basis for Complementary Medical Techniques; (4) Outline of Biological Magnetohydrodynamics; (5) Biophysical Mechanisms of Genetic Regulation: Is There a Link to Mind-Body Healing? and (6) A Proposal for Inferential Evidence of the DNA Phantom Effect. 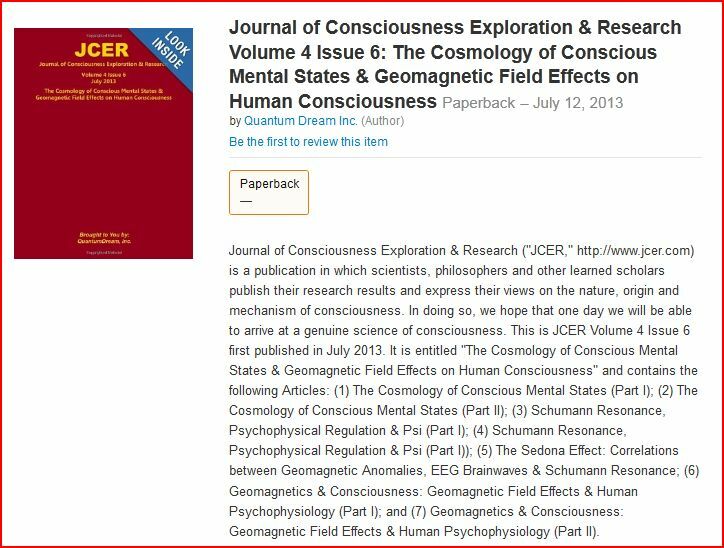 Journal of Consciousness Exploration & Research ("JCER," http://www.jcer.com) is a publication in which scientists, philosophers and other learned scholars publish their research results and express their views on the nature, origin and mechanism of consciousness. In doing so, we hope that one day we will be able to arrive at a genuine science of consciousness. 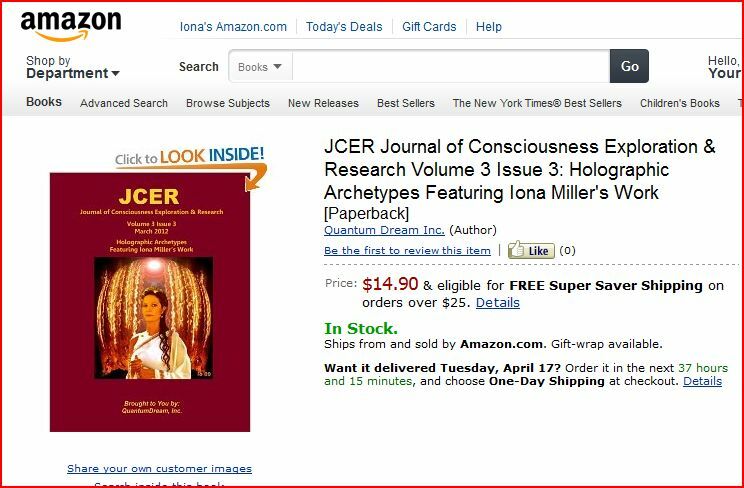 This is JCER Volume 3 Issue 3 first published in March 2012. 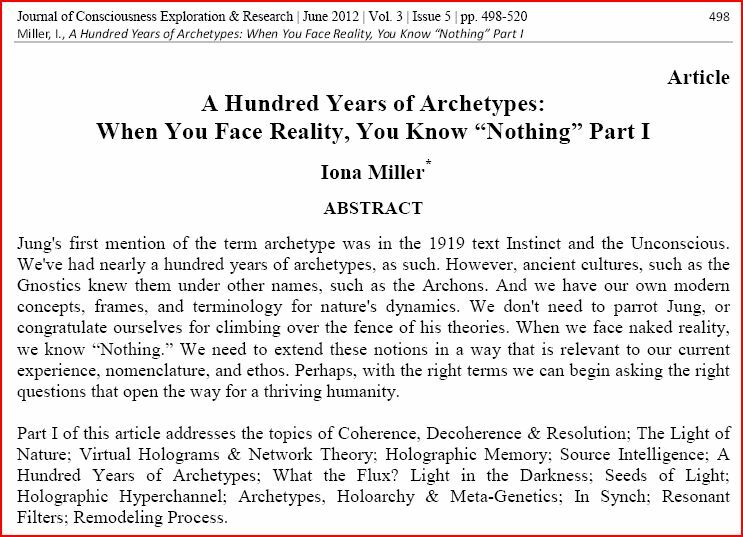 It is entitled "Holographic Archetypes" featuring Iona Miller’s Work and contains following Articles: (1) The Nonlocal Mind Paradigm: A Transdisciplinary Revision of Mind-Body in Philosophy, Art & Science; (2) How the Brain Creates the Feeling of God: The Emergent Science of Neurotheology; (3) The Whole Sum Infinity: Merging Spirituality and Integrative Biophysics; (4) Holographic Archetypes: Top Down & Bottom Up Control of Personal & Collective Consciousness; (5) Natural Philosophy: Beyond The Undulant Quiescence; and (6) An Ongoing Model of Reality by Alan Oliver. 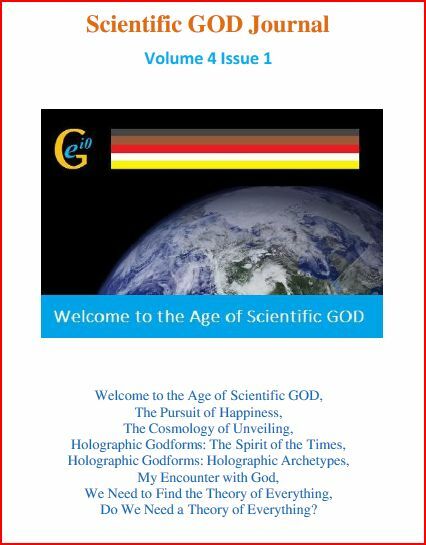 The purpose and mission of Scientific GOD Journal (http://www.scigod.com) are to conduct scientific inquiries on the nature and origins of life, mind, physical laws and mathematics and their possible connections to a scientifically approachable transcendental ground of existence – we call "Scientific GOD." We believe that in this Golden Age of Science the GOD in whom we trust should be spiritual as well as scientific. Indeed, since we are all made out of the same subatomic, atomic and genetic alphabets, the scientific GOD each of us seeks should be one and the same whatever our race, religion and other differences. 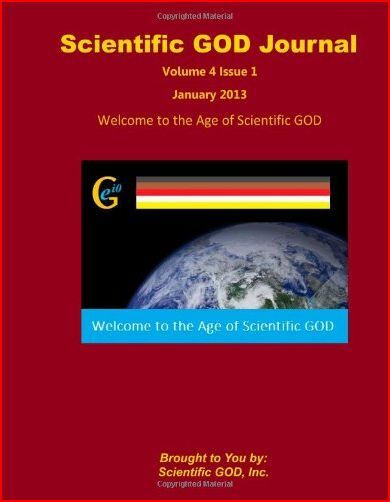 This is Scientific GOD Journal Volume 3 Issue 3 first published in March 2012. It is entitled "Divine Quantum Information Structure, Synchronicity & Luminous Ground" and contains the following Articles: (1) The Physical Universe as a Divine Quantum Information Structure; (2) Synchronicity: When Cosmos Mirrors Inner Events; (3) Luminous Ground: The Zero with a Thousand Faces; (4) Bhrgu: The God of God Particle; and (5) Four (4) Book Reviews. Scientific God Journal: "Synchronicity: When Cosmos Mirrors Inner Events"
Synchronicity explores the borderland between meaning, chaos, and spacetime, where chance meets necessity, when external and internal circumstances align in meaningful coincidence. A peculiar order emerges from randomicity at the creative edge of chaos. Beyond apophenia, simple superstition and psychological projection, it links the observable and unknowable, the effect of the particular and specific with the universal. Not every correlation will have an explanation. In this nonlocal effect, certain qualities manifest relatively simultaneously in different or proximate places. It is a parallelism that cannot be explained causally, but contains meaning and value, and thus the silent resonance between mind, brain, and environment has real effects in the real world. The first effects of warping our perspective are on our attutudes and worldview, which modify our spirituality, thinking, emotions, being and behavior. Is this psychic phenomenon kindled by an invisible field effect linking multidimensional spaces? Quantum mechanics reveals stunning secrets of nature, but it is a science of frozen frames, snapshots of observation and measurement, rather than a process-oriented science that shows how they fit seamlessly together. Fixed time and relative time intersect in a holographic universe. The most fundamental archetype of process is the undivided Field with vortices of meaning which can interact with, combine with, and even cancel one another out. A torus, in essence, is a self-reflexive, self-sustaining energy system, constantly spreading outward and recycling inward. 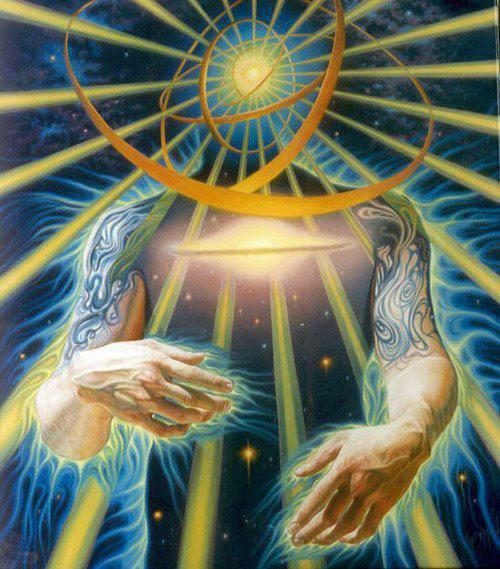 There is a zero-dimensional point at the center of every torus, which for humans is the heart field, which mirrors the planetary magnetic field and the universal field through which we are inextricably woven together. The quantum vacuum is a dynamic massless scalar field. Scalars are just active information; a hologram is pure information. Entanglement is a property of nonlocal quantum information exchange and a correlate of synchronistic phenomena, but may or may not explain its true nature. Entanglement and other quantum phenomena remain attempts to explain the Mystery of the unknown. The overall effect can be characterized as the radiance of Being. unifying, compelling narrative that continues unfolding meaning, purpose, and insight. and The Great Year. Jung took an interest in astrology because he found it archetypally predictive. A Review of the Field from 1973 - 2002"
Peter Gariaev introduces an interesting theory of entwining terahertz waves to gather phase information about the molecules within its path. 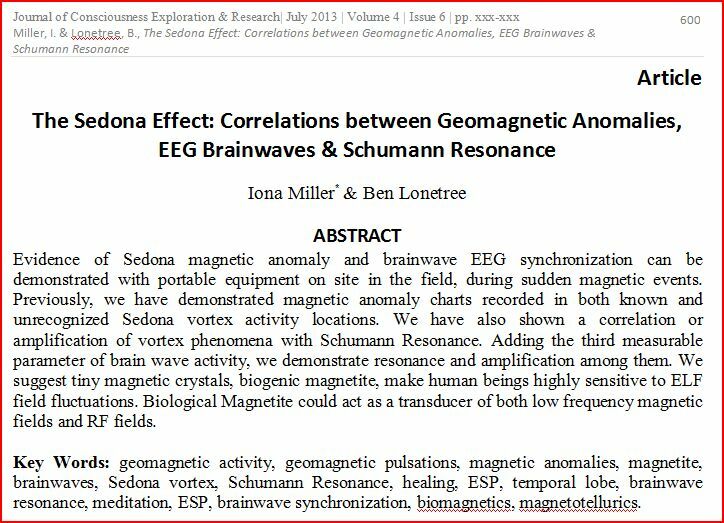 This is a great concept in light of the paper entitled "submillimeter wave spectroscopy of biological macromolecules" by tatiana globus provides evidence that important biological information at the DNA level exist in these frequencies. Peter Gariaev's idea is similiar to that of US Patent 12920161 PHASE CONTRAST IMAGING METHOD AND APPARATUS. "A method for phase contrast imaging comprises: illuminating an object with terahertz radiation such that it interacts with the object, illuminating a diffraction grating by resulting terahertz radiation, translating the intensity distribution at the diffraction field, and a system for retrieving a phase contrast image. During mitosis, the DNA base pairs form gratings at wavelengths close to that of hydrogen bonds and effects the chemicals attached to the DNA. A similiar effect is detailed in Google Patents 12530304 Method of Local Electro-Magnetic Field Enhancement of Terahertz. Since wavelength is important to these theories, I would like to see biological light and sound velocities included in future editions. I foresee Star Trek devices built in the future working at Terahertz frequencies to detect and eradicate all pathagens and virus'. This technology is already being developed in Patent 12394332 Methods for Using Resonant Acoustic and/or Resonant Acousto-EM (use google patent search). Also read "Story of the Dotto Ring" and Google for further info. Unified Model of Bivacuum, Particles Duality, Electromagnetism, Gravitation and Time. Abstract: The Bivacuum model is a consequence of new interpretation of Dirac's theory, pointing to equal probability of positive and negative energy. 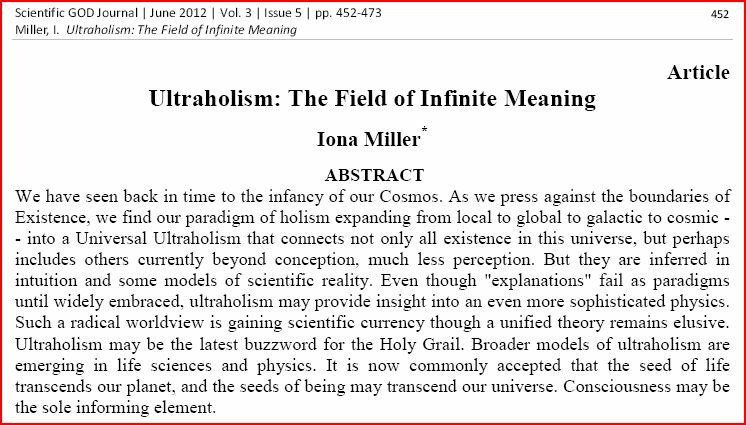 Unified Model (UM) represents our efforts for unification of vacuum, matter and fields from few ground postulates. New concept of Bivacuum is introduced, as a dynamic matrix of the Universe, composed from non mixing sub-quantum particles of the opposite energies, forming vortical structures. These structures, named Bivacuum fermions and antifermions, are presented by infinitive number of double cells-dipoles, each cell containing a pair of correlated rotors and antirotors: V(+) and V(-) of the opposite quantized energy, virtual mass, charge and magnetic moments. Creative, novel and enriching psychotherapeutic experiences can lead to neurogenesis, gene expression, and healing which facilitate mindbody communication and can have a long-term transformative effect on the whole person (Rossi, 2002). Thus, bioholography has relevant applications for optimizing health, well-being and even self-realization. It is relevant in biophysics, medicine, psychobiology, psychotherapy and the holistic healing arts. It provides us with a more genetically integrated model of the complex dynamics of the mindbody -- one arising in the domain underlying the standard genetic code triplet model. Abstract: This paper describes the phenomenon of broadband radiowave radiation (RR) produced by a special optical quantum generator. It is shown that RR can be used as the basis of polarization/laser/radiowave spectroscopy of substances. The spectroscopy mechanism closely connected with inelastic scattering and photon localization in electronic systems of laser mirrors is physically and mathematically formalized. This differs from the traditional Raman effect of photons. The spectrum of inelastic scattered light is continuous and occupies the full frequency range from 0 up to 2w (w- frequency of scattering photon). The mechanism of an EPR (Einstein-Podolsky-Rosen) effect for localized photons is offered. It is shown that the existence of unique localized photons (rather than EPR-correlated photon couples) is sufficient to transmit signals instantaneously (permissive teleportation). 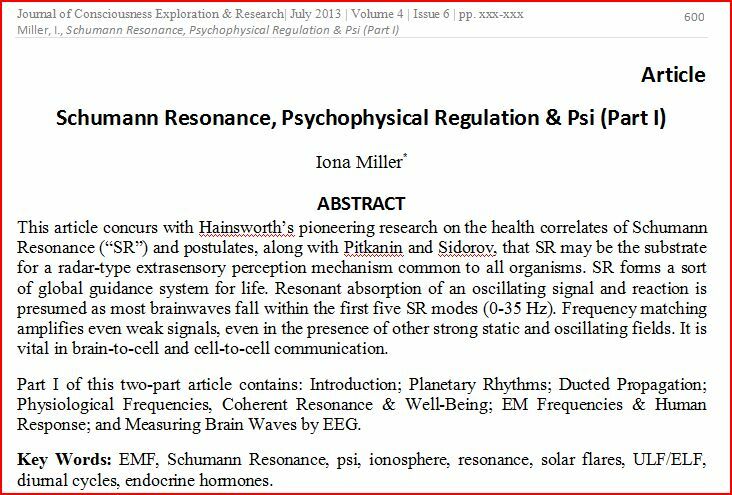 It is shown that RR, read from DNA samples, carries morphogenetic signals. RR of DNA induces in recipient plants morphogenetic modifications and is also capable of repairing radiation-induced genetic damage in plants. It has been proposed that RR transmission from DNA to recipient plants takes place through permissive teleportation. 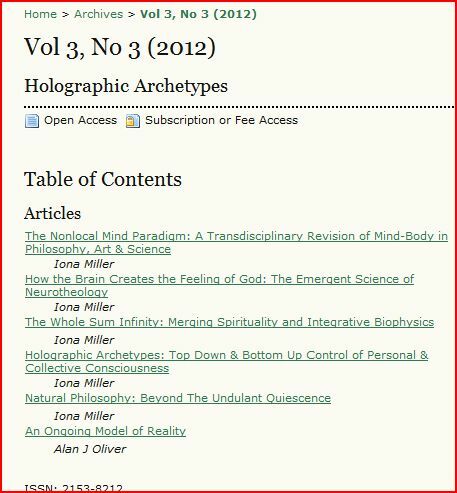 Abstract: Embryonic Holography is part two of a two-part article dealing with biological holography, subtle energy systems of the body and the "psychedelic" or mind-manifesting aspects of DNA. Part one of this study was published in PM&E vol.5 and focused on the chemo-electrical and biomagnetic aspects of how part of the body set up holograms. 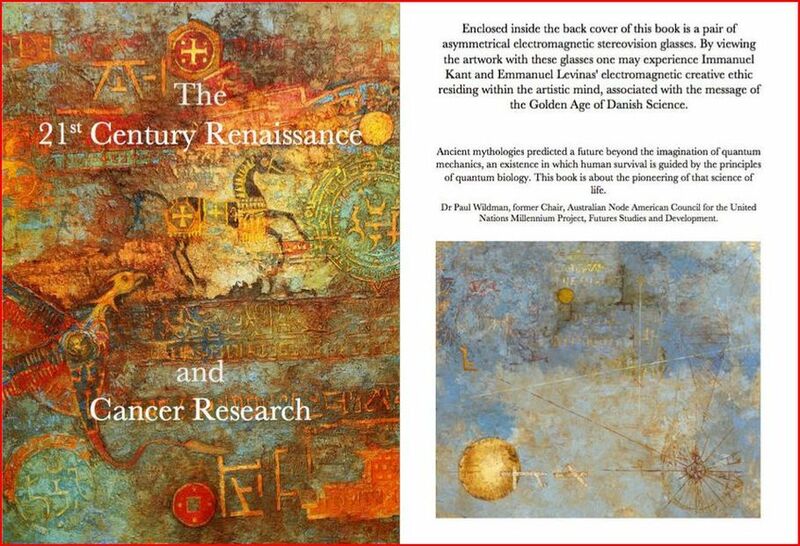 The second part deals with biogenesis and neurological regeneration, and includes speculation on the origins of cancer, faith healing, psychic surgery and more technical aspects of mind-body energetics. 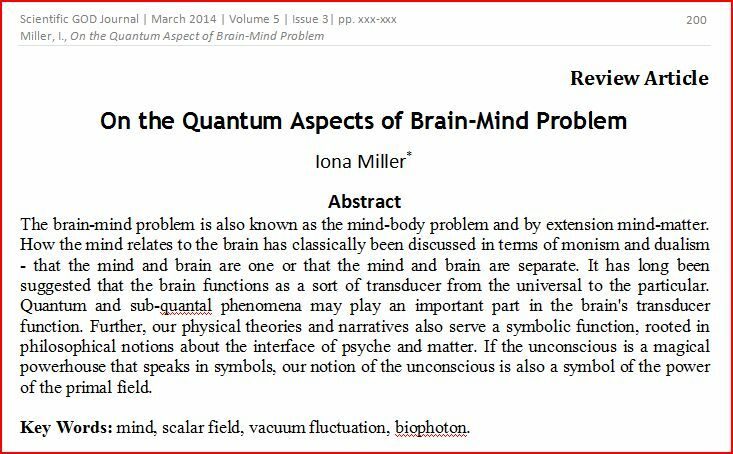 ABSTRACT: In quantum physics, there is no unambiguous description of consciousness and its role in the continuous creation and sustaining of matter. If it plays a fundamental role in existence we must look for it at the very root of all evolutionary processes in the fundamental forces of our universe which lead to the conditions that facilitate life as a potentially universal process. One such candidate for nature's fine-tuning system is the weak force, whose descriptors echo the traits of the pre-scientific and alchemical notion of the Anima Mundi, or World Soul, an embodiment of intrinsic vital connections among all life. 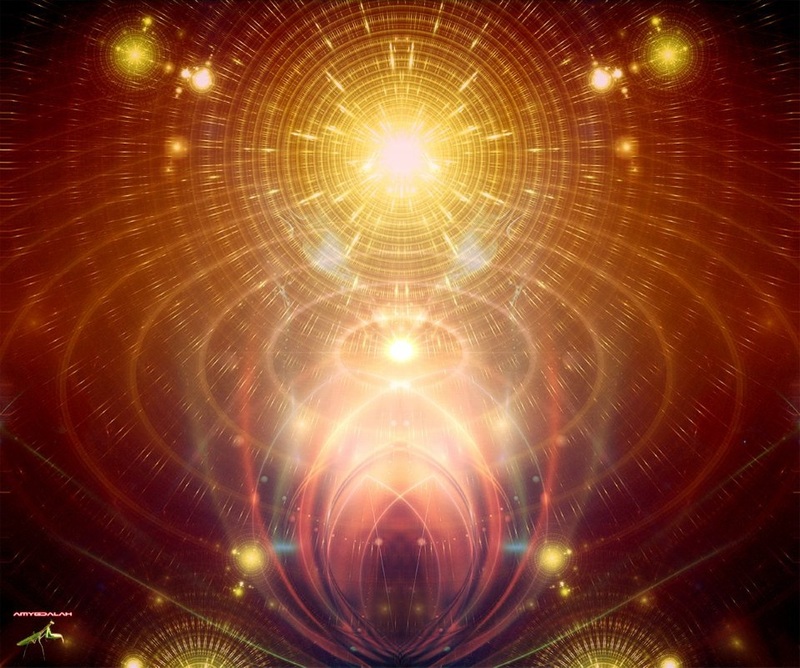 The Jungian and archetypal worldview still recognizes such a living force within, attributing its life-sustaining energies to soul and the depth-dimension of our imaginal and perceptual experience. 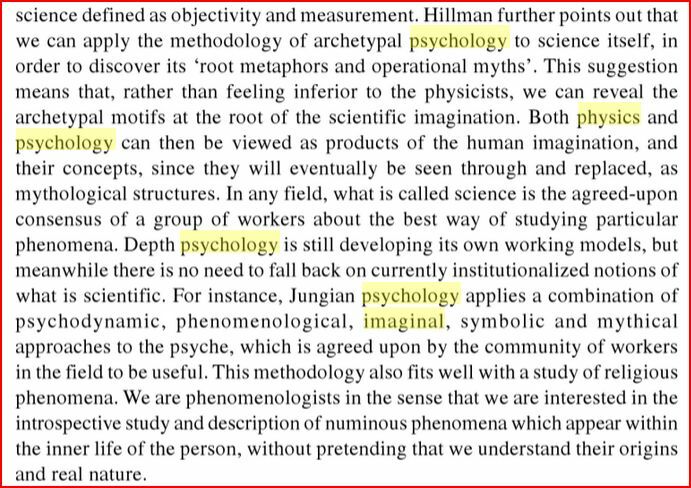 An enriching non-literal interpretation of such phenomenology may still be more than metaphorical. Anima mundi, by any other name such as "weak force", only needs to be a tiny fraction of one of the myriad feedback loops to be the deciding difference due to the unbelievably delicately balanced state that potentiates and fosters universal life, potentially originating in space (Hoyle, Wickramasinghe). In this sense she (embodied as the Weak Force and Weak Emergence) makes the Sun shine, creates water, and the "Goldilocks" zone of human habitation. Agents of Chaos: Is the observed strength of the weak force vital for the emergence of observers? Emergence is a possible order arising from chaos. Weak emergence describes new properties arising in systems as a result of the interactions at an elemental level. Weak emergence is a type of emergence in which the emergent property is reducible to its individual constituents. This is opposed to strong emergence, in which the emergent property is irreducible to its individual constituents. More and more evidence is piling up that quantum mechanics plays a central role in the functional organization of biology. This has consequences for consciousness. New Scientist magazine had a couple of articles recently that pointed out that quantum states can be entangled through ordinary sound and another one that discovered that entanglement spreads throughout such systems in kind of a snowball fashion. Why are we continually materializing the vacuum? if the wavelength is large its more convenient to measure the wave characteristics. if wavelength is small its usually easier to measure the particle characterisrics. force field undergoes a quantum space phase transition to a “hedge boson force field”, consisting of a “vacuum” core surrounded by a hedge boson shell, like a bubble with boundary. universe model, the universe not only gains its existence from the vacuum but also fattens itself with the vacuum. During the inflation, the adjacent vacuum as the added space also generates the periodic table of elementary particles to account for all elementary particles and their masses in a good agreement with the observed values. The universe ends with the return of the adjacent vacuum to the pre-inflationary universe, and it is subsequently absorbed to start another new inflationary universe. The universe is an endless fattening free lunch. Causing systems to differentiate, weak emergence is the root of higher-order complexity, coalescing novel, coherent structures. Agents residing on one scale start producing behavior that lies one scale above them, potentially including self-reflection. Humans become self-conscious and track their own evolution. Heeding the "inner voice" of the Anima mundi, can applied emergence help us work with the dynamics of emergent complexity to realize our intentions as life-serving outcomes?